America was watching, riveted. Eyes glued to screens across the nation. All signs pointed to a win for blue. But Modern is a strange beast. During the tournament’s final hour, its rust belt of Lightning Bolts exploded into a sea of crimson. Cries of “how did this happen?” and “where did we go wrong?” echoed around the top tables as the disenfranchised triumphed, and expensive manabases bowed to an unlikely tyrant. Skred Red had won a Modern GP. Kevin Mackie’s win with Skred signals major shifts in Modern we must account for to succeed in the format. With an RPTQ on the horizon, tuning Monkey Grow to combat this new metagame has been my number one priority. 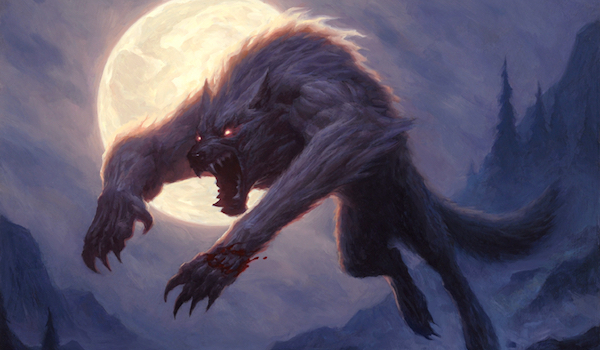 This article details the testing I’ve done over the last week with an overhauled sideboard that benches Bedlam Reveler and returns to the deck’s Huntmaster roots. A couple weeks ago, I wrote an article detailing how to beat the many linear decks currently dominating in Modern. The two best ways, I argued, were either to play a faster linear deck or to run hate. In terms of overall metagame picture, Modern’s linear shift can be attributed to the rise of Dredge. The biggest effects of that deck’s success are the renewed viability of linear decks and the redesigning of interactive decks to deal with it. Infect had a tremendous showing at GP Dallas, trumping every other archetype in terms of representation. Bant Eldrazi, Dredge, Burn, Affinity, Death’s Shadow Aggro, and Valakut were runners-up. This metagame spread demonstrates how fast Modern became to usurp Dredge, a deck that put up impressive numbers pre-Kaladesh, and then practically reached boogeyman status after the printing of Cathartic Reunion. Against linear decks, Bedlam Reveler has never been the plan for Monkey Grow. Several of these linear matchups even had me missing Huntmaster of the Fells, including Eldrazi, Burn, and Affinity. With Modern pedaling away from interaction, Reveler loses some appeal. The problem with control decks in Modern has always been their need to address too many issues at once. All these linear decks breaking out has done a number on goodstuff answer strategies like Jund, reinforcing this notion. Interactive decks are turning out in record lows since the Eye of Ugin fiasco. Many interactive decks in the format seem to be turning to heavy-duty hate to help themselves stay relevant. Grafdigger’s Cage and Relic of Progenitus have dwindled in blue and green sideboards, being replaced by Rest in Peace (Eldrazi, Nahiri) and Leyline of the Void (Jund, Abzan). I have been impressed with the Bedlam Reveler package’s performance in Monkey Grow and amazed by how favorable it turned our Jund matchup. But I acknowledged the plan’s weakness to hate cards, specifically citing Chalice of the Void and Rest in Peace and omitting Leyline of the Void based on its absence from top decks. With Leyline enjoying more play than ever, relying on Bedlam Reveler to beat up on interactive decks becomes very suspicious, especially considering there are even less interactive decks around to beat up on in the first place. If the RPTQ were tomorrow, I would play this. The main draw to Monkey Grow is the deck’s positioning against linear strategies. Disrupting Shoal makes even nut draws from the fastest combo decks manageable, and Lightning Bolt is still the most effective way to interact with opponents counting to ten. Dredge posed a potential problem for Monkey Grow, although Shoal has always given us an edge in the matchup other Delver decks lacked. Cathartic Reunion made Dredge so explosive and resilient I found we needed to include some sort of specific hate in the sideboard to beat it. Transitioning away from Traverse-Reveler and towards the lighter Huntmaster package gives us space to play Surgical Extraction in the sideboard, which I believe is the best way for interactive aggro decks to attack Dredge. With Dredge taken care of, and Huntmaster pulling weight again vs. go-wide red decks like Zoo, our linear matchups are totally covered. Vapor Snag has been awesome against faster aggro decks, so I made sure to keep one in the main. Same with Tarfire, which stays on at two copies. I considered a fourth Thought Scour to push out speedier Apes, but many of the linear decks currently in Modern are ones we need to interact with via Lightning Bolt before committing threats, so delve tends to pay for itself. The lack of spell-based linear decks like Tron and Ad Nauseam makes me think three is still the optimal number of Scours. In previous versions, I decried Snapcaster Mage as the deck’s worst card and a necessary evil for the Traverse plan in the sideboard. Having access to a searchable copy of any spell in the graveyard was too good to pass up in many post-board games. Here, Snap serves as an additional tool against interactive decks and a fifth Bolt in matchups that put Monkey Grow on the defensive. Simic Charm is another archetype staple that’s been omitted from recent versions. Bedlam Reveler works best in a shell with as many one- and zero-mana spells as possible. This condition, combined with the rise of pump decks in Modern, made Vapor Snag a more appealing choice. The nail in the coffin for Simic was that we had interactive decks covered with Bedlam Reveler, so getting over a big Goyf with +3/+3 or saving Delver from Abrupt Decay with hexproof was less relevant. Without Bedlam Reveler, we’ll need some more points against interactive decks in the mainboard. Ultimately, a two-mana Vapor Snag remains pretty valuable against pump decks. Charm’s other modes help enough against Jund & co. that I’m liking a pair for now. When modifying a deck to combat a given metagame, it’s crucial to remember that metagames are cyclical. For example, Corey Burkhart correctly anticipated a field of linear aggro decks at GP Dallas, and tuned Grixis Control to beat up on those decks by stocking it full of self-replacing removal spells. Despite Modern becoming more linear as a whole, control decks made a strong showing in the Top 8. One might construe after GP Dallas that interactive midrange decks like Burkhart’s and Mackie’s are about to make a comeback in Modern. These decks—especially Jund—have always presented issues for Monkey Grow, and Bedlam Reveler addressed this weakness perfectly. So why abandon the Reveler now? I don’t think Monkey Grow pilots need to fret too feverishly about a Terminate renaissance. For one, a metagame dramatically tilted towards linear aggro seems to me like the only one in which Modern control decks can succeed. The counterspells control decks need to employ to deal with linear combo decks simply aren’t efficient enough to make those matchups walks in the park, even with proper tuning. This situation explains why Wizards bans linear combo decks that enjoy levels of success similar to those of linear aggro (Storm, Amulet Bloom). Removal, on the other hand, is plentiful, giving midrange decks adequate tools to quell a ground assault. One obvious way to attack these removal-heavy Terminate decks is to sleeve up linear combo, and I’m sure we’ll see more Ad Nauseams in the immediate future. Mackie himself admitted these matchups were close to impossible for Skred Red to overcome, and I doubt Burkhart’s blend of Bolts and Commands would have proved much more competent. Notably, Temur Delver specializes in stomping decks that win on the stack. A natural reaction to removal-based control decks would be for linear aggro to decrease in metagame share. But I don’t think the metagame can afford to slow down to deal with Grixis Control and friends, if only because Dredge forces other aggro decks to be so proactive. With linear combo poised to return in some capacity, and linear aggro going nowhere, the Huntmaster plan seems superior to the Reveler one despite last weekend’s victories for Grixis, Jeskai, and Snow. I’m as excited about Monkey Grow as I ever have been, and every metagame shift invigorates me with new ideas, projects, and challenges. If I could wish one thing for all Modern players, it’s that they too find a deck they love enough to play and tune no matter the metagame. Hi Jordan i really like monkey Grow, its a super sweet deck with alot of game, if you play it properly. Have you ever thougt of using delay instead of manaleak? Delay might be decent while we’re employing a tempo plan, but it doesn’t do much when we want to grind opponents out. Leak does both. It’s true that Leak is weaker in the late-game, but once we’re in the late-game, our chances of tempo-ing out opponents drops significantly. This makes Leak better than Delay in pretty much any stage of the game.